Under the bright desert sun of northwest India, small things sometimes cast long shadows. Take the town of Bagru, for example: Just a short drive from Jaipur on the highway to Ajmer, this Rajasthani village has developed a decidedly large influence on the art of Indian block printing. For at least 400 years, Bagru has been home to the Chhipa — a clan whose name comes either from a Gujarati word meaning “to print” or from combining two Nepal Bhasa words: ‘chhi’ (“to dye”) and ‘pa’ (“to leave something to bask in sun”). The latter theory feels especially true as you walk through the vast communal drying fields that connect the Chhipa Mohalla —the village printers’ quarters. The air here is redolent with the fragrance of drying fabric; The ground and the concrete walls are covered in resplendent oranges, blues, and pinks. Everywhere you turn in Bagru, it seems, is a scene which will stop you in your tracks. Vijendra (‘Viju’) Chhipa continues this community tradition. A fifth-generation dyer and a Master Printer, Viju is founder of Bagru Textiles – a company which builds upon the legacy of his family’s cloth dying and printing business. Since taking over after his father’s death in 2007, Viju has worked to employ local families and to grow new markets for Rajasthani block printing. His efforts are paying off: Fabrics from Bagru Textiles have been used by international brands like Block Shop, Beastly Threads, Molly Mahon, Penny Sage, and Rekh & Datta — and Indian block printing has been gaining momentum as a global design trend (as evidenced by recent looks from Vogue and the New York Times). At least sixteen families regularly work as the master printers, dyers, block carvers, dhobiwalas (laundry people), and designers needed to meet this growing market demand. A portion of Bagru Textiles’ profits support community initiatives for the entire Chhipa community and Block Shop has developed their own program to reinvest in the village, sponsoring health clinics and providing water filters for co-op families. A Chhipa printer decides how many blocks to use by the number of colors and shapes in the print design. Generally, a printer first stamps the background block (called a gudh), followed by an outline block (the rekh). The datta are the filler blocks which complete the design. On average, a printer will need at least 4 or 5 blocks to create a hand printed cloth. It can take one or two days to carve and prepare a single block as the selection and seasoning of local woods is an involved process and specific to each pattern design. In Bagru, carvers often use woods like Sagwaan (Teak), Sheesham (Indian Rosewood), or Rohida (sometimes called ‘Desert Teak’ or ‘Marwar Teak’) when constructing blocks. Sagwaan is favored when durability and softness is needed while, conversely, the relative hardness of Sheesham is suited to intricate or detailed motifs. Walk into any printer’s quarters in Bagru and you’ll often see the same tools: A long, low printing table, the blocks (of course), and a rolling trolley which holds a dye tray and a few other items. For regular hand block printing, a printer first dips the wooden printing block in the dye tray before pounding the center of the block onto the fabric with his or her fist. The pattern is repeated, aligning the blocks by eye. Traditional Bagru prints use dark (or colored) patterns on cream or dyed backgrounds. Another style, called dabu, creates light-colored motifs on a dark background using mud-resist printing. There are also items made with discharge printing, using citric acid on grey alum dye. Color is one way to differentiate Bagru prints from those made in nearby Sanganer: In Bagru, the cloth has either a cream-colored or a dyed base, while Sanganeri prints have a white base. Sanganer prints are known for delicate floral and leaf motifs. Bagru prints use these natural designs, but also incorporate geometric shapes — such as leher (waves), chaupad (checks), and kangura (triangles), and jaali — a gridded trellis pattern which may have been adapted from Islamic architecture. Adapting these motifs to contemporary fashion requires added precision: The abundance of empty spaces in modern patterns tends to reveal the unintentional dye drips which often go unnoticed in busier, traditional designs. Dabu is a mud resist mixture made from local black clay (kaali mitti), wheat powder (bidhan), guar gum, and lime water. 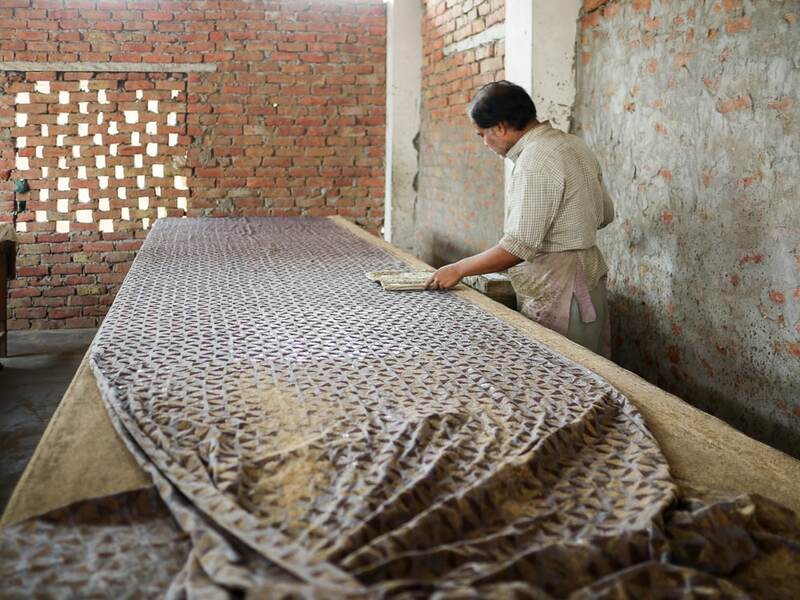 After the printer applies the dabu print pattern, a fine layer of sawdust is sprinkled over the fabric to help prevent it from sticking to itself during the dye process. The motifs made with the mud resist remain uncolored while the rest of the fabric is dyed. Sometimes this process is repeated to achieve tonal gradients. Before dyeing, fabric is soaked in harda — a natural mordant made from the myrobalan fruit and which binds color to the fabric and gives it a distinct yellowish color. Blues are made from Indigofera tinctoria, stored in dye vats 10 to 12 feet deep. Different hues of red colors (begar) are created by mixing varying proportions of alum (fitkari), madder (lal mitti) and acacia arabica (also called babul gond). Alum is used for greys and syahi (fermented waste iron, jaggery, and water) for blacks. Though most colors used in the Bagru process are natural, the Chhipa occasionally boost them with non-toxic chemical dyes to create brighter colors. The natural environment is, in the end, what makes Bagru block printing so identifiable. The weather. The water. The wind and the dust. The wood in the blocks and the plants in the dyes. The seasons which drive production here are natural, not industrial: During the hot and dry months, workers fill the courtyards with fabrics — until monsoon season brings work to a halt. Those rains haven’t been as plentiful in recent years and the region’s water table has dropped, threatening the long-term production of textiles in the village. Water preservation in Rajasthan is crucial and, since the dyes here are mostly derived from plants and minerals, villagers now reuse production water to irrigate crops. Over several centuries, the Chhipa tradition has endured — and even thrived — in the face of challenges like these. And if that history is any guide, it seems likely that they’ll continue their indelible style of block-printing for generations to come. As a freelance contributor of interviews, narrative journalism, analysis, and photography to publications like The Atlantic, Los Angeles Review of Books, New York Magazine, Harper's Bazaar India, AFAR, Travel + Leisure, and others, I travel around the world to document interesting human stories.